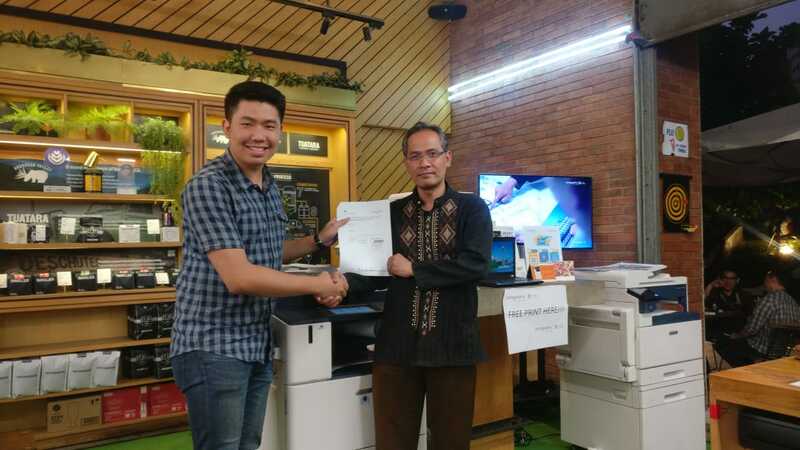 Jakarta, 24 September 2018 –In order to improve the customer experience of printing machines, Astragraphia holds an Office Corner activity with the theme "Smart Office Solution". This event was one of Astragraphia’s activity to introduce, exhibit and also promote office’s document solution. Astragraphia showcases digital multifunction color products or devices for both small, medium and large office categories. The "Smart Office Solution" activity was held for five days starting from Monday 24 September 2018 to Friday, September 28, 2018, at St. Ali Setiabudi One Building 2 to get closer with office workers as the target audience of this activity. At this event, Astragraphia displayed some Fuji Xerox Multifunction Printer. Some of these products include the first type of ApeosPort-VI C3371 engine, the DocuCentre SC2022 type, and the last one is the DocuPrint CM315z type with various document solutions. Customers or guests can directly try those machines to elevate their own experience towards the printing machine which has a bunch of benefits. The document solution by Fuji Xerox is an example of solutions that meet various customers’ needs. Thus, the customer experience about printing machine and document solutions will increase. The Multifunction Machine (photocopy, print, scan) ApeosPortVI Series is one of our products that showcased in this activity to introduce Smart Work Gateway, the latest solution concept to facilitate business people to optimize their work. With Smart Work Gateway, business people can do mobile and flexible work, remove barriers to work and provide opportunities to work productively. Print & Photocopy Speed: 25 - 70 sheets per minute. Other solutions that can be obtained from using this machine are mobile print, Print Anywhere, One Touch Scan, Long Banner Printing (297x1200 mm), and others. Next, Fuji Xerox DocuCentre SC2022 which features easy operation machine, Mobile Connectivity, Enhanced Feature Capability, and High-Quality Print Performance as well as several solutions including Wi-Fi Direct, Secure Print, Secure Fax, Air Print & Google Cloud Print Ready. And lastly, Fuji Xerox DocuPrint CM315z, the machine that has some functions which are: Print, Copy, Scan and Fax with the new CCSLED Technology with ICT which produces 1200 x 2400 dpi resolution, Mobile Connectivity: Air Print, Mopria ™ Alliance, Wi-Fi Direct, NFC Enabled, 4.3-inch touch screen with customizable icons, more energy efficient with Super EA-ECO toner, Auditron and Automatic Duplex Features. During the "Smart Office Corner" event, invited guests or booth visitors not only gain experience and insights about printing machines, printing, and photocopying solutions, but they will also get souvenirs from Astragraphia Document Solution. Along with "Smart Office Solution" event, Astragraphia hopes to be closer to customers and hear the customer needs directly from them. The customers can also consult with business consultants and system analysts from Astragraphia in the Office Corner "Smart Office Solution" booth to find the suitable office document solution. For further information please click "Contact Us"
Have you ever heard the word Zine? in general, Zine stands for fanzine or magazine, is an alternative print media which is usually published in a personal or small group and multiplied by photocopying. Astragraphia Document Solution in cooperation with a business partner, PT Zoom Infotek Telesindo run Educational Program under the name "Zoom Educare Program (ZEDPRO), a cooperation program between industry and education world especially SMK.